Sept. 5, 2018 -- The CH-UH City School District utilizes several digital resources for at-home learning for all grade levels. Clever is an “all in one” portal that houses many of the applications our students use every day in their classrooms. Students can access Clever at https://clever.com/in/chuh. When students are prompted to “Log in with Google,” they should enter their assigned district email account (username@chuh.org) and district password (including CHUH, all CAPS, at the end). Clever is also available on the District website under the Academics tab. Once students login, they will see different apps depending on their assigned grade levels, school, and courses. All students have Google accounts that give them access to the G Suite for Education apps, including Google Drive (where all their digital work is stored “in the cloud”), Google Classroom (where students complete online assignments, communicate with teachers, and collaborate with peers), and Google Docs (an online word processing tool). Students can login to their Google accounts at account.google.com from any device, and Google apps are also available through Clever. Students in Grades 2-12 have Study Island accounts. Based on the MAP (Measure of Academic Progress) assessment results, students have learning paths unique to their specific strengths and needs in reading and math. High school students can also use Study Island to prepare for their End of Course exams and ACT or SAT exams. Students can access Study Island through Clever. Visit our District website at www.chuh.org for other online learning resources, including some that are extensions of our English/reading, math, science, and social studies curricular programs. Go to the Academics tab, and then select Library & Online Resources from the drop-down menu. 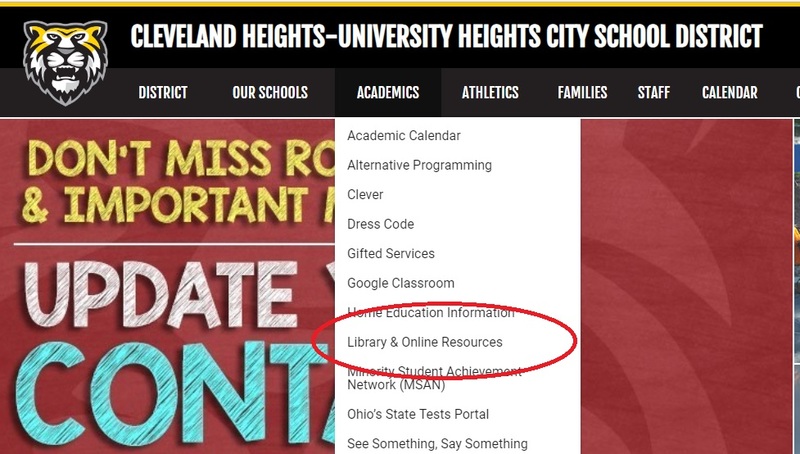 From the left sidebar, select Elementary, Middle, or High School Online Resources. Many sites require a login. If “Log in with Google” is not an option, please check with the teacher to find out your child’s assigned username and password. For assistance with home access, email Christina Bauer, Program Specialist for Technology, at C_Bauer@chuh.org (or call 320-3149).